Partington Stands bought by Audio Manogamy in Birmingham | What Hi-Fi? "I realised it was time to move on when I went over to a friend's house and he told me he'd bought a terrific new hi-fi system – it turned out to be a B&W Zeppelin iPod dock," says Partington. Partington says he was going to sell the business to his Benelux distributor, but backed out when they said they'd manufacture the stands in China. Now the company has been snapped up by Audio Manogamy, who will manufacture the stands in Birmingham. A spokesman for the new owner says: "We've got a local company to build them. Most of the existing dealers will remain, and we should have new stock of the Super Dreadnought, Broadside, Trophy and ANSA 60 models by early December. The prices will remain the same." Peter Partington will oversee the transition to the new manufacturing site and help out with exhibitions. "I don't want to cut and run completely," he told whathifi.com. 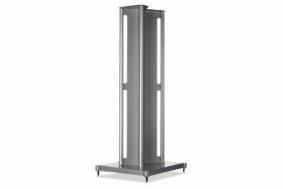 The Partington ANSA 60 was voted Best Speaker Stand in the What Hi-Fi? Sound and Vision Awards 2010. A new Audio Manogamy website with contact details and a list of distributors will go online shortly.